WASHINGTON — Tuesday marked day three of the hearing for former Metro Police Department Officer Sean Lojacono who is appealing his firing. It's clear the case isn't about whether Lojacono searches violate MPD rules and regulations. It appears they did. The real issue is what is written in the general orders versus what has being done on the street. The more important question is whether Lojacono can be fired for tactics that he says are common practice for officers. “I’m pretty disappointed about how things have gone because all I’ve ever tried to do was the right thing and now I’m being thrown to the wolves because of the way I was as trained,” Lojacono said on the stand Tuesday afternoon. "I don’t go out of my way to humiliate people. I understand that people perceive some of the things I’ve done as wrong, but I wasn’t trying to embarrass anybody." In a stunning moment, Lojacono admitted the way he conducted two invasive body searches on September 27, 2017 was common practice, and that he had conducted “hundreds” of similar searches in his 5-year career. Lojacono testified that he knew both searches violated with his training at the police academy and the general orders of the DC Metropolitan Police Department. Lojacono testified veteran officers in District 4 and the department’s Narcotics and Special Investigation Division taught him to closely and thoroughly inspect the groin and crotch area of a subject even when that person has not been placed under arrest because that’s where criminals typically hide guns and drugs. Prosecutors called the two searches in question in his case: “eerily similar. Multiple character witnesses for Lojacono said he should receive additional training, but not be fired, even if board finds he violated policy with his searches. Defense called retired Sgt. John Brennan, a former supervisor, who did instruction and training for officers regarding regarding field searches, specifically NSID. He reviewed body worn camera video of the Lojacono search and said it was by the book. "He did it properly, did it back to front and nothing was there," Brennan said. Brennan said MPD's general orders specifically instruct officers to search the crotch and sock area, and should be included in those areas you need to give special attention. "I always told people that worked for me. Don't be afraid to go up in the crotch," Brennan said "A lot of people who are searched complain about that being too intrusive. A lot of the people who complain about that being too intrusive have something up there." At issue is where officers have latitude about whether to lightly pat down subjects for weapons. It's a much higher burden than to do more invasive body search, including groin and buttocks area. Lojacono is accused of going too far with searches on suspects who aren't in custody or under arrest. "You watch, 'Cops' on TV, 99 percent of the time they don't tell them what they are under arrest for, so no, we don’t have to tell them what they were under arrest for. The Police Academy and the streets are two different places. Once you are out in the streets you are in the real world," Brennan said. "Isn't it important for police officers to follow the rules and general orders of the Police Department?" prosecutors later asked Brennan. "When you can," Brennan said. Brennan, who graduated from the police academy in 1971 and has been retired for years, admitted he did not know the MPD general order regarding arrests and searches "word for word," and that his understanding of what's allowed comes from his decades of experience on the street. Brennan was asked if Lojacono should be fired even if his search is found to violate MPD general orders. "From what I saw today on the videos, the general orders are guidelines that should be followed. No, I do not believe he should be terminated. I know his work ethic," Brennan said. The general order regarding "Transportation and Searches of Prisoners" has been updated a number of times over the years, most recently 2014. Read the general order here. Lojacono's sergeant during his time at NSID, Lt. Christopher Dove, testified as Lojacono's character witness. "Self-initiating officer, didn't have to push him to work, very self-motivated," Dove said. "One thing that impressed me pretty quickly: Officers with more time actually looked up to him." Dove also said Lojacono had great instincts as narcotics officer. "His eyes were so good" when it came to spotting drug deals, Dove said. "That impressed me. I liked working with Sean. I never saw any indication that he would want to violate a persons civil rights. He's just a good officer." Dove placed blame for Lojacono incident on the MPD saying he does not think officer should be fired even if found to have violated MPD's general orders. "I understand there's an allegation, but I do think that additional specific training department wide is needed in my opinion. We don't do as a department enough of that across the board," Dove said. Michael Anzallo, Assistant Chief of Metro Transit Authority, was Lojacono's supervisor when viral video of his search on M.B. Cottingham was investigated. Anzallo said Lojacono received letter of prejudice for not placing Cottingham under arrest for drinking in public, but not for search itself. 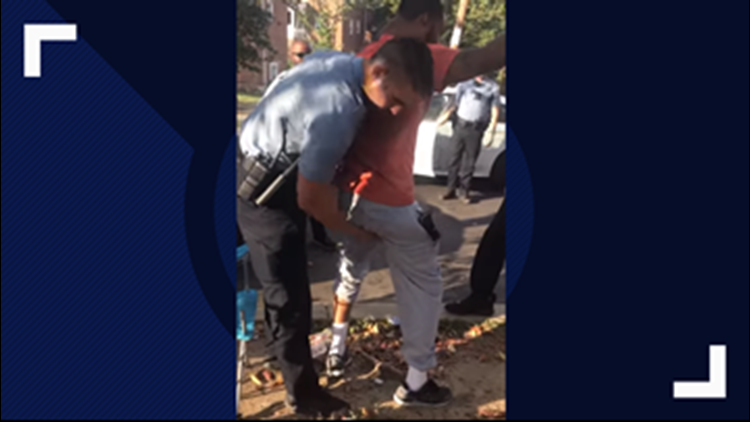 He said that style of search of a suspect's groin was not how he was trained to do it at academy - which follows the DC Police Department general orders and guidelines - but rather veteran officers at 4D and NSID taught him how to use the more invasive searches in the field. “The first day I got there I was told: rookie forget everything you learned at the academy. That’s not how it’s done.” Lojacono estimated he would witness hundreds of arrests in his time at NSID that resulted in discovery of narcotics using the groin search. In the Cottingham case, Locjacono said he intrusively searched that area only to find out it was bunched up underwear. He said Cottingham initially agreed to be searched, and when he revoked consent Lojacono felt case law allowed him to keep searching. Lojacono’s defense attorney, Marc Wilhite, also argued the department’s decision to fire him for the second, previously unreported search was a knee jerk reaction to the public outrage for that viral cell phone video WUSA 9 first broadcast in February 2018, and that the police department felt public pressure to take additional action and fire Officer Lojacono. Wilhite told the appeals board the officer shouldn’t be the fall guy for that. Officer Lojacono has been on paid desk duty while waiting for this hearing and will continue receiving a paycheck as the board debate whether to uphold his firing. A decision is expected sometime in April.